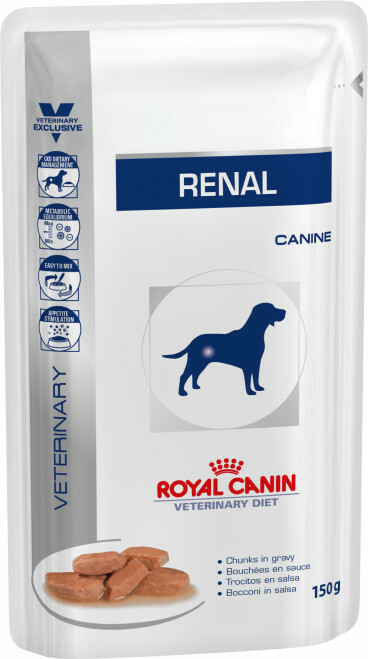 Renal (pouch) For dogs with Chronic kidney disease (CKD). 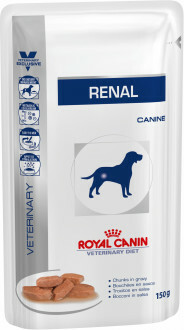 The chunks in gravy texture of Renal pouches are easy to stir into dry Renal food. A palatable formula and chunks in gravy texture helps stimulate appetite. Chicken meats, pork meats, wheat flour, corn flour, sunflower oil, minerals (including calcium carbonate, potassium citrate, zeolite), corn starch, sugar beet pulp, cellulose, vegetable lecithin, fish oil, corn gluten, taurine, fructo-oligosaccharides (FOS), marigold meal (source of lutein), methionine, trace elements (including chelated trace elements), vitamins. Crude ash: 1.2%. Crude fibre: 0.7%. Crude oil fats: 6%. Moisture: 80%. Protein: 3.9%. Vitamin D3: 120IU, E1 (Iron): 9mg, E2 (Iodine): 0,36mg, E4 (Copper): 2,9 mg, E5 (Manganese): 2,7mg, E6 (Zinc): 27mg.